Home > Economics help blog > economics > Should the government intervene in the economy? Should the government intervene in the economy? One of the main issues in economics is the extent to which the government should intervene in the economy. Free market economists argue that government intervention should be strictly limited as government intervention tends to cause an inefficient allocation of resources. However, others argue there is a strong case for government intervention in different fields, such as externalities, public goods and monopoly power. 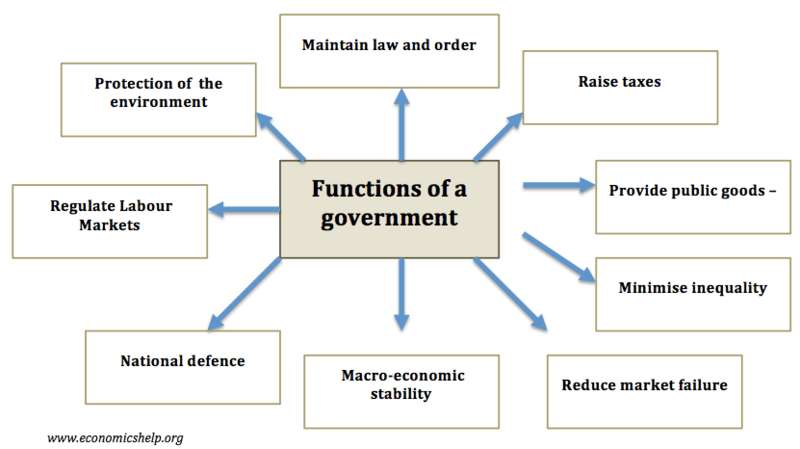 This is a summary of whether should the government intervene in the economy. Greater equality – redistribute income and wealth to improve equality of opportunity and equality of outcome. Market failure – Markets fail to take into account externalities and are likely to under-produce public/merit goods. For example, governments can subsidise or provide goods with positive externalities. Macroeconomic intervention. – intervention to overcome prolonged recessions and reduce unemployment. 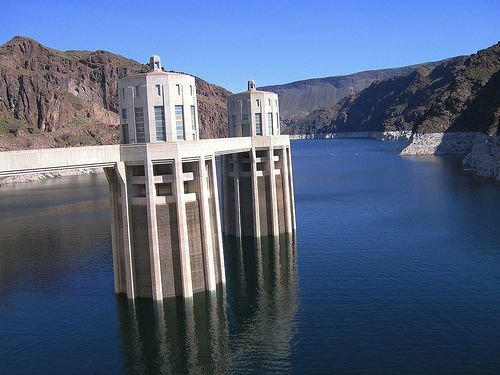 Governments liable to make the wrong decisions – influenced by political pressure groups, they spend on inefficient projects which lead to an inefficient outcome. Personal freedom. Government intervention is taking away individuals decision on how to spend and act. Economic intervention takes some personal freedom away. The market is most efficient at deciding how and when to produce. In a free market, there tends to be inequality in income, wealth and opportunity. Private charity tends to be partial. Government intervention is necessary to redistribute income within society. Diminishing marginal returns to income. The law of diminishing returns states that as income increases, there is a diminishing marginal utility. If you have an income of £2 million a year. An increase in income to £2.5 million gives only a marginal increase in happiness/utility. For example, your third sports car gives only a small increase in total utility. However, if you are unemployed, and surviving on £50 a week. A 10% increase in income gives a substantial boost in living standards and quality of life. Therefore, redistributing income can lead to a net welfare gain for society. Therefore income redistribution can be justified from a utilitarian perspective. Fairness. In a free market, inequality can be created, not through ability and handwork, but privilege and monopoly power. Without government intervention, firms can exploit monopoly power to pay low wages to workers and charge high prices to consumers. Without government intervention, we are liable to see the growth of monopoly power. Government intervention can regulate monopolies and promote competition. Therefore government intervention can promote greater equality of income, which is perceived as fairer. Inherited wealth. Often the argument is made that people should be able to keep the rewards of their hard work. But, if wealth and income and opportunity depend on being born into the right family, is that justified? A wealth tax can reduce the wealth of the richest, and this revenue can be used to spend on education for those who are born in poor circumstances. Rawls social contract. Rawls’ social contract stated that the ideal society is one where you would be happy to be born in any situation, not knowing where you would end up. Using this social contract, most people would not choose to be born in a free market because the rewards are concentrated in the hands of a small minority of the population. If people had no idea where they would be born, they would be more likely to choose a society with a degree of government intervention and redistribution. 2. Merit goods / Positive externalities. Goods like education and health care are not strictly public goods (though they are often referred to as public goods). In a free market, provision tends to be patchy and unequal. Universal education provided by the government ensures that, in theory, everyone can gain an education, which has a strong social benefit. 3. Negative externalities. The free market does not provide the most socially efficient outcome, if there are externalities in consumption and production. For example, a profit maximising firm will ignore the external costs of pollution through burning coal. This leads to a decline in social welfare. By contrast, other forms of energy production, like solar power, are environmentally friendly and have a positive externality. By taxing production which causes pollution costs and using the subsidy to encourage other forms of energy production, there is a net gain in social welfare. 4. Regulation of monopoly power. In a free market, firms may gain monopoly power; this enables them to set higher prices for consumers. Government regulation of monopoly can lead to lower prices and greater economic efficiency. Should governments save declining industries? Yes. If large industries go out of business, there will be high regional unemployment and market failure from the difficulty in finding new jobs. No. If the government prop up declining industries, they will be saddled with high costs and a permanently unprofitable industry. See more at: Solutions to declining industries. In recessions, there is a sharp fall in private sector spending and investment, leading to lower economic growth. If the government also reduce spending at the same time, there is an even bigger fall in economic growth and collapse in confidence. In a deep recession, governments can borrow from the private sector and spend the money to employ unemployed resources. If there is a collapse in the money supply, there may be a role for the Central bank or Government to print money. Similarly, the government may need to prevent an economic boom and explosion of credit. Keynesian economists argue that the government can positively influence the economy through fiscal policy. Monetarists believe monetary policy can help encourage economic stability, though an independent Central Bank may not be considered government intervention. When governments spend on public goods and merit goods, they may create excess bureaucracy and inefficiency. State owned industries tend to lack any profit incentive and so tend to be run inefficiently. Privatising state owned industries can lead to substantial efficiency savings. Politicians don’t have the same market discipline of seeking to maximise the use of limited resources. 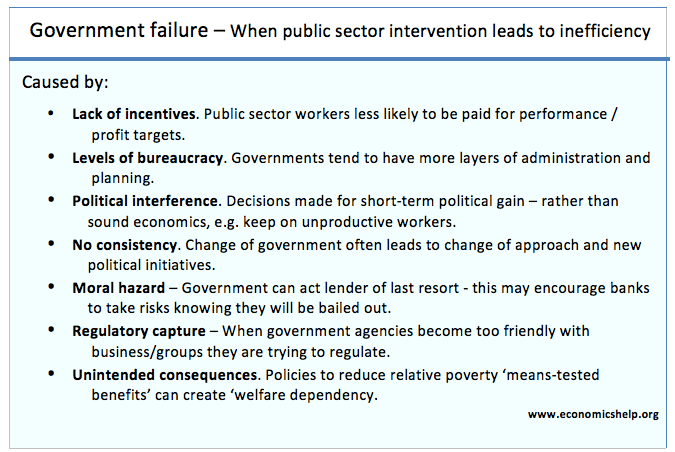 Government intervention causes more problems than it solves. For example, state support of industries may encourage the survival of inefficient firms. If governments bailout banks, it may create moral hazard where in the future banks have less incentive to avoid bankruptcy because they expect a government bailout. Real business cycle theorists argue that at best government intervention makes no difference to the length of a recession, but may just create additional problems, such as the accumulation of public sector debt. This entry was posted in economics and tagged governments. Bookmark the permalink. In addition to your post I was wondering, Do you think Romney will bailout and encourage his wall street backers like Obama? Do you believe that Romney will use the governing administration to intervene in the financial system like Obama? Do you think Romney will pay big like Obama, what authentic cuts is he talking about? Do you presume the architect of Obamacare will perform to get rid of it? Do you consider he will keep our troops engaged? Do you consider he will do whatever to reign in the Federal Reserve? How accurately will Romney be ANY diverse from Obama? yes it should because it reduces monopoly which tends to exploit the masses. Money is not an object of nature, therefore money must be false, abundant, and free at its source, which is the central bank. You cannot create anything that is real or true by using something false like money. Therefore, no matter how you look at the economy, this economy (CBE or the central bank economy) will be always wrong or false.